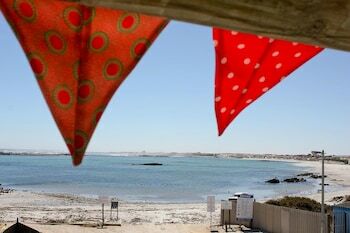 Located in Port Nolloth, Voetbaai Chalets is by the ocean, within a 10-minute drive of Port Nolloth Beach and Immaculate Heart of Mary Church. Featured amenities include express check-in, express check-out, and luggage storage. Free self parking is available onsite. Located in George, Two Fat Owls Guesthouse is a 1-minute drive from Garden Route Botanical Garden and 8 minutes from Kingswood Golf Estate. Free self parking is available onsite. When you stay at Old Thatch Lodge in Swellendam, you'll be next to a golf course and within a 5-minute drive of Dutch Reformed Church Swellendam. Free self parking is available onsite. When you stay at Jozi Apartments Radiokop in Roodepoort, you'll be within a 10-minute drive of Eagle Canyon Golf Club and Ticketpro Dome. Free self parking is available onsite. With a stay at Houghton Heights A in Bakoven (Camps Bay), you'll be convenient to Theatre on the Bay and Table Mountain. Featured amenities include express check-in and laundry facilities. With a stay at J101 Waterstone in Cape Town (Century City), you'll be within a 15-minute drive of Cape Town International Convention Centre and Ratanga Junction. With a stay at Harbour Terrace Apartments, you'll be centrally located in Cape Town, a 5-minute drive from Cape Town Stadium and 8 minutes from Cape Town International Convention Centre. When you stay at Kambaku River Sands in Hoedspruit, you'll be 13 minutes by car from Thornybush Game Reserve. Free self parking is available onsite.